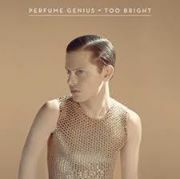 When Perfume Genius, Seattle native Mike Hadreas, released ‘Queen’, the first single from his third full-length Too Bright, it raised a few eyebrows from fans that had followed his work all the way from the demos he had offered on Myspace before the turn of the decade. The naked heart that was the metronome of tracks such as ‘Mr Peterson’ and ‘Learning’, tracks so fragile that they felt like they’d fall apart as you listened to them, was now almost completely impenetrable and obscured by a ribcage of flamboyance and assurance. On ‘Queen’ Mike shrieks the battle-cry “No family is safe, when I sashay” with confidence, backed by pounding drums and electronics that are a world away from the minimal arrangements of his earlier work. By no means is it a poor track; in song-writing terms it stands comfortably alongside the material on ‘Learning’ and ‘Put Your Back N 2 It’, but its release seemed to be a precursor to a change of direction that might hinder just what makes Mike’s music so alluring; the fragility, the nervousness, the beauty. Fortunately Too Bright, whilst being by far the most developed and exotic Perfume Genius album to date, does not forsake pure, primordial emotion. Infact the album’s highlight, and you could even go as far as saying the highlight of the Perfume Genius catalogue to date, is when he combines these two elements. ‘Fool’ begins with finger-clicks and a bouncing synth riff, evocating the sexuality and ambiance of Prince or Ziggy Stardust-era David Bowie, but at the point that you expect it to launch into a thumping chorus in the same manner as the preceding ‘Queen’ it instead wilts to a striking, untamed reverb-soaked falsetto, the kind that My Morning Jacket‘s Jim James used to break hearts with until his ego got the better of him, before it builds back up again. Further highlights can be found at both ends of the album’s sonic spectrum. ‘Grid’ is all tribal percussion and howls, Mike’s fastest and most aggressive track to date and one of a handful on which he hands vocal duties to a third party, bringing to mind tUnE-yArD‘s W H O K I L L S album at its darkest. Contrasting this in the final third of the album is the stunning ‘I’m A Mother’, an over-bearing death march that kneels at the mid-point between Sigur Rós‘ ‘Avalon’ and the first three tracks on their landmark ( ) album. Pitch-shifted vocals, their meaning for the most part incalculable, choke to be heard below an impenetrable organ riff, and it sounds like sorrow and fear and uncertainty and throat cancer. In the end for all the dressing placed upon Too Bright, that naked heart still beats and its rhythm is still as hypnotic as ever.